This protocol describes how to generate induced pluripotent stem cells (iPSCs) from human peripheral T cells in feeder-free conditions using a combination of matrigel and Sendai virus vectors containing reprogramming factors. Kishino, Y., Seki, T., Yuasa, S., Fujita, J., Fukuda, K. Generation of Induced Pluripotent Stem Cells from Human Peripheral T Cells Using Sendai Virus in Feeder-free Conditions. J. Vis. Exp. (105), e53225, doi:10.3791/53225 (2015). Recently, iPSCs have attracted attention as a new source of cells for regenerative therapies. Although the initial method for generating iPSCs relied on dermal fibroblasts obtained by invasive biopsy and retroviral genomic insertion of transgenes, there have been many efforts to avoid these disadvantages. Human peripheral T cells are a unique cell source for generating iPSCs. iPSCs derived from T cells contain rearrangements of the T cell receptor (TCR) genes and are a source of antigen-specific T cells. Additionally, T cell receptor rearrangement in the genome has the potential to label individual cell lines and distinguish between transplanted and donor cells. For safe clinical application of iPSCs, it is important to minimize the risk of exposing newly generated iPSCs to harmful agents. Although fetal bovine serum and feeder cells have been essential for pluripotent stem cell culture, it is preferable to remove them from the culture system to reduce the risk of unpredictable pathogenicity. To address this, we have established a protocol for generating iPSCs from human peripheral T cells using Sendai virus to reduce the risk of exposing iPSCs to undefined pathogens. Although handling Sendai virus requires equipment with the appropriate biosafety level, Sendai virus infects activated T cells without genome insertion, yet with high efficiency. In this protocol, we demonstrate the generation of iPSCs from human peripheral T cells in feeder-free conditions using a combination of activated T cell culture and Sendai virus. iPSCs have attracted considerable attention as a groundbreaking source of cells for regenerative medicine1-3. To date, diverse methods for generating iPSCs have been reported4,5. Among these, iPSCs generated from human T cells have been of particular interest because of the less-invasive method of cell sampling6-8. Additionally, iPSCs derived from T cells contain rearrangements of the T cell receptor (TCR) gene and are thus a source of antigen-specific T cells9,10. Therefore, generating T cell derived iPSCs safely is useful for progressing regenerative medicine. This method is based on the concept of reducing the risk of unpredictable pathogenicity. For safe clinical application of iPSCs it is important to reduce the risk of exposure to pathogens11. Previously in many culture systems of pluripotent stem cells, fetal bovine serum and feeder cells have been used as essential reagents12. However, removal of both these reagents from the culture system is preferable for iPSC generation to reduce the risk of unpredictable pathogenicity. Additionally, this method has the advantage of avoiding invasive cell sampling from patients and laborious preparation of feeder cells. Because T cell derived iPSCs have already been used successfully in disease research13,14, this method is also applicable and useful for generating disease-specific iPSCs from patients. Among T cell reprogramming methods, using the Sendai virus (SeV) vector as a gene vehicle is a method that can generate iPSCs with high efficiency7,16. Additionally, because SeV is a single-stranded RNA virus and does not need a DNA phase for replication, its use in iPSC generation avoids breaking the host genome17-19. Therefore, we have established protocols for generating iPSCs from human peripheral T cells in serum-free and feeder-free conditions using a combination of matrigel, mTeSR medium, and SeV vectors. Collect 10 ml heparinized whole blood from a donor by venipuncture. Obtain informed consent of donors in advance of venipuncture. Venipuncture must be done by qualified and trained personnel. Handle obtained blood samples with sterile equipment and following appropriate biosafety guidelines. Dilute 10 ml heparinized whole blood with 10 ml D-PBS(–). Put 15 ml Ficoll solution (Ficoll-Paque PREMIUM) into a new 50-ml conical tube. Layer the 20-ml blood solution prepared in Step 1.2 onto the Ficoll solution in Step 1.3. Using an electric pipette, let blood solution prepared in Step 1.2 run slowly along the inside wall of tube. Be careful not to mix the blood solution and Ficoll solution. Centrifuge at 400 × g for 30 min at RT. Set the centrifugal deceleration speed to “slow”. Note: After centrifugation, a white thin layer emerges between an upper milky plasma layer and a lower clear Ficoll layer. This white thin layer contains mononuclear cells. Transfer the mononuclear cell layer to a new 50-ml conical tube with a 1-ml pipette. Be careful not to include Ficoll solution. Add D-PBS(–) to the mononuclear cells to a total volume of 10 ml, and centrifuge at 200 × g for 5 min at RT. Discard the supernatant. Add 10 ml of D-PBS(–) to the mononuclear cells, and centrifuge at 200 × g for 5 min at RT. Discard the supernatant, add 1 ml of KBM502 medium to the collected mononuclear cells, and count the cells using a hemocytometer. Over 5 × 106 mononuclear cells can be obtained from 10 ml heparinized whole blood with appropriate separation using Ficoll. Prepare an anti-human CD3 antibody solution at a concentration of 10 µg/ml in D-PBS(–). Add the anti-human CD3 antibody solution to a 6-well plate, soak the surface of each well, and incubate the dish at 37 °C in a 5% CO2 incubator for at least 30 min. Remove the anti-human CD3 antibody solution from each well and wash once with D-PBS(–) just prior to seeding the cells. Seed mononuclear cells that were prepared in Step 1.9 at a density of 2.5 × 105 cells/cm2 on the anti-human CD3 antibody-coated 6-well plates in KBM502 medium. Incubate at 37 °C in a 5%-CO2 incubator for 3–7 days without medium change until the T cells reach confluency. T cells in this period are both suspended and adhering cells. After 3–7 days culture, collect the activated T cells with existing medium by pipetting. Transfer them to a 15-ml conical tube and centrifuge at 200 × g for 5 min at RT. Remove the supernatant and add 1 ml fresh KBM502 medium. Count the cells and plate 1.5 × 106 cells (in 2 ml fresh KBM502 medium) into each well of an anti-CD3 antibody-coated 6-well plate. Thaw the SeV solutions of OCT3/4-SeV/TSΔF, SOX2-SeV/TSΔF, KLF4-SeV/TSΔF, and c-MYC (HNL)-SeV/TS15ΔF on ice. Add the SeV solutions containing OCT3/4-SeV/TSΔF, SOX2-SeV/TSΔF, KLF4-SeV/TSΔF, and c-MYC (HNL)-SeV/TS15ΔF individually to the wells, each at a multiplicity of infection (MOI) of 10. Incubate at 37 °C in a 5%-CO2 incubator for a further 24 hr. 24 hr after infection, collect the infected cells with a pipette. If there are adhering cells, they can easily be detached pipetting them repeatedly up and down. Transfer them to a 15-ml conical tube, and centrifuge at 200 × g for 5 min at RT. Remove the supernatant containing the SeV vectors, and add 2 ml fresh KBM502 medium. Replate cells in each of the wells. Incubate at 37 °C in a 5%-CO2 incubator for an additional 24 hr. Prepare basement membrane matrix solution by thawing matrix gel (please see the Materials List for the specific brand used in this study) at 4 °C and dissolving 0.2 ml in 10 ml of DMEM/F12 medium. Note: Matrix gel (please see the Materials List for the specific brand used in this study) needs to thaw O/N at 4 °C to be completely thawed. Keep it on ice until just before use. Plate 5 ml basement membrane matrix solution per dish into 100-mm dishes and leave at RT for at least 30 min before seeding cells. At least two 100-mm dishes are needed for one experiment. Collect SeV-infected cells by pipetting, transfer them to a 15-ml conical tube, and centrifuge at 200 × g for 5 min at RT. Remove the supernatant and add 1 ml fresh KBM502 medium. Count the number of cells using a hemocytometer, remove the basement membrane matrix solution from 100-mm dishes prepared in Step 4.2 and plate 1 × 105 and 1 × 106 cells (in 10 ml fresh mTeSR medium) on a 100-mm basement membrane matrix-coated dishes. Finally, use the plate in which colonies are easily picked. Incubate the dish at 37 °C in a 5%-CO2 incubator O/N. Change the medium to 10 ml flesh mTeSR medium every other day. Note: Approximately 20–30 days after infection, colonies that closely resemble embryonic stem cells (ESCs) will appear. Plate 1 ml of the basement membrane matrix solution per well in a 6-well plate and leave at RT for at least 30 min before picking colonies. Fill a 96-well plate with 20 µl of mTeSR medium per well. Select colonies that resemble ESCs under the stereomicroscope using a 20 µl pipette. Note: The colonies of ESCs and iPSCs are round and flat as shown in Figure 1B. Transfer selected colonies into the 96-well plate filled with mTeSR medium in Step 5.3. Add 200 µl of mTeSR medium to each well and carefully pipette up and down to break the colony into small clumps under the stereomicroscope using a 200 µl pipette. Remove the basement membrane matrix solution from the well prepared in 5.2 and put each colony into one well of the basement membrane matrix-coated 6-well plate with 2 ml of mTeSR medium per well. Change the medium to 2 ml flesh mTeSR medium every other day. The T cell-derived iPSCs can be maintained and stored using the same techniques as for human iPSCs and human ESCs. Once iPSC colonies grow up, expand them into larger dishes by repeating the same procedure. Change the mTeSR medium every 1–2 days. When the colonies become confluent every 5–7 days, passage the cells using dissociation solution for human iPSCs and human ESCs according to the manufacturer’s instructions. Using this protocol, users are able to generate iPSCs from human peripheral T cells stably. iPSC generation from T cells with SeV and matrigel showed approximately 0.002% – 0.005% of efficiency of cell reprogramming in between several donor cases and SeV were not detected after several passages16. Figure 1A shows a schematic of the protocol for generating T cell-derived iPSCs in feeder-free conditions using matrigel and mTeSR medium. Around 20–30 days after infection with SeV, iPSC colonies are recognized by their ESC colony-like morphology (Figure 1B). Immunofluorescence staining revealed expression of typical pluripotent cell markers (NANOG, OCT3/4, SSEA4, TRA-1-60, and TRA-1-81) in T cell-derived iPSCs generated under feeder-free conditions (Figure 1C). Figure 1. (A): A schematic of the protocol for reprogramming T cells under feeder-free conditions in this study. (B): A typical ESC-like iPSC colony on day 27 after blood sampling under feeder-free conditions. (C): ALP staining and immunofluorescence staining for pluripotency and surface markers (NANOG, OCT3/4, SSEA4, TRA-1-60, and TRA-1-81) in T cell-derived iPSCs generated under feeder-free conditions. Please click here to view a larger version of this figure. We describe a protocol for generating iPSCs from human peripheral T cells in serum-free and feeder-free conditions using a combination of matrigel, mTeSR medium, and SeV vectors. For clinical applications of iPSCs, it is important to have a protocol for stably generating iPSCs and a less-invasive method for cell sampling. Although generating iPSCs with the combination of matrigel and mTeSR medium showed lower reprogramming efficiency than that with knockout serum replacement (KSR) medium and feeder-cells, this combination achieves stable generation of iPSCs from donors16. Stable iPSC generation and less-invasive cell sampling has the advantage of being able to increase the number of donors for iPSC generation. SeV vectors, a minus-strand RNA virus, is not integrated into the host genome. Therefore the risks of tumorigenesis can be avoided at the step of reprogramming factor induction20-24. Additionally, the feeder-free conditions, which use a combination of defined culture medium and matrigel instead of a feeder layer, make it possible to minimize the potential risks of exposure to unknown exogenous factors. The fusion of these techniques provides a less invasive and safer iPSC technology for regenerative medicine16. Important steps in this protocol are the step of activating human T cells (Step 1) and infecting them with SeV vectors (Step 2). When no ESC-like colony is obtained in the culture dish at an optimal time after SeV infection, the following should be considered. First, the confluency of the mononuclear cells before T cell activation may not be appropriate because optimal activation of T cells is critical for SeV infection25,26. Too high a density of mononuclear cells leads to cell death, interfering with the proper activation of T cells. Too low a density of mononuclear cells also disturbs the proper activation and proliferation of T cells. Therefore, the confluency of mononuclear cells should be checked and adjusted accordingly. Second, the dosage of SeV vectors may not be sufficient. The induction efficiency of iPSC colonies depends on the dosage of the virus6. If no ESC-like colony is observed after SeV infection, the option of increasing the virus dosage up to an MOI of 15-20 should be considered. If signs of iPSC colony differentiation are observed, the frequency at which medium is changed may be increased up to every other day, or to every day when colonies are larger. The limitation in this protocol consists of this method not being virus free. Although SeV for cell reprogramming is commercially available with ease, users need to prepare equipment according to the appropriate biosafety level. As another method for generating integration-free iPSCs, episomal vectors have been used until now27-29. Although episomal vectors can be used with equipment with a lower level of biosafety, episomal vectors might insert into the host genome at extremely low rates. Therefore, additional checks are required to confirm the disappearance of transgenes, as when using SeV. There is another limitation in that this technique is not absolutely free from animal-derived products. Some substrates, such as matrigel, anti-CD3 mAb, dissociation solution and SeV solution are derived from animal products and are therefore associated with a risk of transferring xenogeneic pathogens. However, the reduction of animal-derived substrates in the culture system is meaningful for the clinical application of iPSC technology due to the lower risk. The authors have no competing or conflicting interests to disclose. We thank Yoshiko Miyake, Sayaka Kanaami, Chihana Fujita, Miho Yamaguchi, Natsuko Henmi, and Rei Ohno from the Keio University School of Medicine for technical assistance. This work was partly funded by an R&D Systems support program to accelerate the practical use of health research outcomes, and the Highway Program for the Realization of Regenerative Medicine. Takahashi, K., et al. Induction of pluripotent stem cells from adult human fibroblasts by defined factors. Cell. 131, 861-872 (2007). Yu, J., et al. Induced pluripotent stem cell lines derived from human somatic cells. Science. 318, (5858), 1917-1920 (2007). Hayes, M., Zavazava, N. Strategies to generate induced pluripotent stem cells. Methods Mol Biol. 1029, 77-92 (2013). Gonzalez, F., Boue, S., Izpisua Belmonte, J. C. Methods for making induced pluripotent stem cells: reprogramming a la carte. Nat Rev Genet. 12, 231-242 (2011). Loh, Y. H., et al. Reprogramming of T cells from human peripheral blood. Cell Stem Cell. 7, 15-19 (2010). Seki, T., et al. Generation of induced pluripotent stem cells from human terminally differentiated circulating T cells. Cell Stem Cell. 7, 11-14 (2010). Staerk, J., et al. Reprogramming of human peripheral blood cells to induced pluripotent stem cells. Cell Stem Cell. 7, 20-24 (2010). Nishimura, T., et al. Generation of rejuvenated antigen-specific T cells by reprogramming to pluripotency and redifferentiation. Cell Stem Cell. 12, 114-126 (2013). Vizcardo, R., et al. Regeneration of Human Tumor Antigen-Specific T Cells from iPSCs Derived from Mature CD8 T Cells. Cell Stem Cell. 12, 31-36 (2013). Sampsell-Barron, T. Xeno-free adaptation and culture of human pluripotent stem cells. Methods Mol Biol. 1001, 81-97 (2013). Minegishi, Y., et al. Enhanced optineurin E50K-TBK1 interaction evokes protein insolubility and initiates familial primary open-angle glaucoma. Hum Mol Genet. 22, 3559-353367 (2013). Tanaka, A., et al. Endothelin-1 induces myofibrillar disarray and contractile vector variability in hypertrophic cardiomyopathy-induced pluripotent stem cell-derived cardiomyocytes. J Am Heart Assoc. 3, e001263 (2014). Ludwig, T. E., et al. Derivation of human embryonic stem cells in defined conditions. Nat Biotechnol. 24, 185-187 (2006). Kishino, Y., et al. 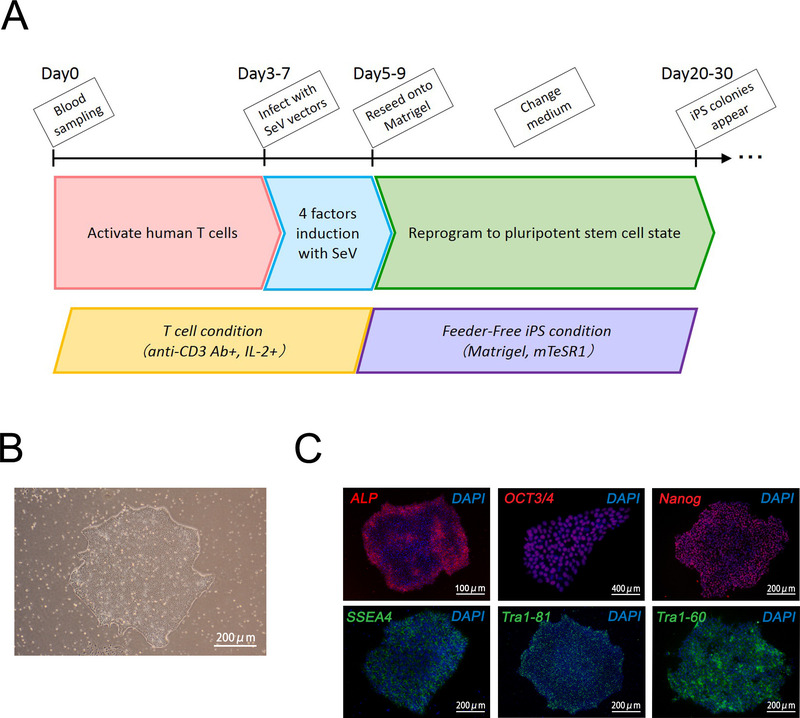 Derivation of transgene-free human induced pluripotent stem cells from human peripheral T cells in defined culture conditions. PLoS One. 9, e97397 (2014). Masaki, I., et al. Recombinant Sendai virus-mediated gene transfer to vasculature: a new class of efficient gene transfer vector to the vascular system. FASEB J. 15, 1294-1296 (2001). Li, H. O., et al. A cytoplasmic RNA vector derived from nontransmissible Sendai virus with efficient gene transfer and expression. J Virol. 74, 6564-6569 (2000). Ikeda, Y., et al. Recombinant Sendai virus-mediated gene transfer into adult rat retinal tissue: efficient gene transfer by brief exposure. Exp Eye Res. 75, 39-48 (2002). Fusaki, N., Ban, H., Nishiyama, A., Saeki, K., Hasegawa, M. Efficient induction of transgene-free human pluripotent stem cells using a vector based on Sendai virus, an RNA virus that does not integrate into the host genome. Proc Jpn Acad Ser B Phys Biol Sci. 85, 348-362 (2009). Macarthur, C. C., et al. Generation of human-induced pluripotent stem cells by a nonintegrating RNA Sendai virus vector in feeder-free or xeno-free conditions. Stem cells Int. 564612 (2012). Iida, A. Sendai virus vector: vector development and its application to health care and biotechnology. Uirusu. 57, 29-36 (2007). Yoshida, K., et al. In vivo repopulation of cytoplasmically gene transferred hematopoietic cells by temperature-sensitive mutant of recombinant Sendai viral vector. Biochem Biophys Res Comm. 361, 811-816 (2007). Bitzer, M., Armeanu, S., Lauer, U. M., Neubert, W. J. Sendai virus vectors as an emerging negative-strand RNA viral vector system. J Gene Med. 5, 543-553 (2003). Seki, T., Yuasa, S., Fukuda, K. Generation of induced pluripotent stem cells from a small amount of human peripheral blood using a combination of activated T cells and Sendai virus. Nat Protoc. 7, 718-728 (2012). Okano, S., et al. Recombinant Sendai virus vectors for activated T lymphocytes. Gene Ther. 10, 1381-1391 (2003). Okita, K., et al. An efficient nonviral method to generate integration-free human-induced pluripotent stem cells from cord blood and peripheral blood cells. Stem Cells. 31, (3), 458-466 (2013). Zhang, X. B. Cellular reprogramming of human peripheral blood cells. Genom Proteom Bioinform. 11, (5), 264-274 (2013). Su, R. J., Neises, A., Zhang, X. B. Generation of iPS Cells from Human Peripheral Blood Mononuclear Cells Using Episomal Vectors. Methods Mol Biol. (2014).